Interview with Osvalde Lewat by Michele Solle, January 26, 2012, republished from CLAP NOIR. Translated from French to English by Beti Ellerson. Michèle Solle: How did you find out about Sappir College? Osvalde Lewat: Erez, the artistic director of the school, saw my film Histoire de Nègres and invited me to the Festival de Cinéma du Sud in June 2009. I had never heard of it before. He telephoned me, we met in Paris. In fact, I stayed in Sderot for ten days, then, I returned to start filming. Avner, who is Ashkenazi, created the film programme at Sappir College. He grew up in a kibbutz and suffered a lot while there. In the film he describes it as a big orphanage, where he felt very much alone, even being part of the elite of society. Erez, also a film professor, and along with Avner, are anti-Zionist who want to break away from the single thought that prevails in their country. Their goal is to respond to the question: "Can one make art while obscuring the context? " What kind of students does the school attract? This is a highly rated school, fourth in the entire Middle East, it is considered a school for the brainy types because of the high level of the students. 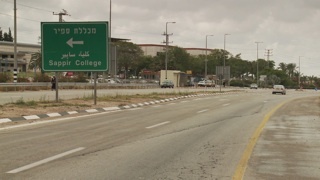 It is located two km from Gaza and the school officials promote total integration, so students from disadvantaged backgrounds may obtain a scholarship. For some of them it is only when attending the school that they meet Arabs for the first time. Some students are part of the ultra right. Students live in Sderot under exceptional conditions, which intensify their reactions. Which is revealed in the scene of the football match on TV? Exactly. In these endless confrontations, we find the best and the worst. In this scene, it’s the worst. After drinking, a few of them let loose and become provocative while on camera. "We are those from the back of the bus!" They claim their marginality, present themselves as dunces, are not interested in the utopian views of the school officials, and are openly anti-Palestinian. They are only interested in learning how to make films. They only make films for entertainment, which, in fact, are popular abroad. What was the film shoot like? There were four of us. I explained my intentions before filming. I do not steal any images, always leaving the camera in plain view. For example, in the scene where Erez analyses an excerpt of Nuit et Brouillard, I filmed continuously. There is a lengthy discussion between students followed by a synthesis, which is the point of departure for reflection. Everything begins with the film courses and evolves from them, going beyond technique. I also cut the odd scenes. How did the people who were filmed react? In this school where Israelis reflect on themselves through the camera, they found my film to be very honest. I am still in contact with some of them. Because it answers my question: What do people want to see? I also want to break with the single thought and I am looking for a method of analysis. I naturally gravitate toward social issues, which always end up political. When presenting the film you mentioned having some difficulties, can you specify which ones? I had difficulty finding funding. It started out well in terms of development aid, but when the filming started I didn’t receive anything. The blame may be placed on the political nature of the subject whose complexity was not very well received. When I went to Sderot for the scouting, I filmed on the spot thinking that I would return, but since I did not get the funding, I had to make the film with what I had, which explains the passages in voiceover. Interview by Michele Solle, January 26, 2012 for CLAP NOIR.